The Stimulist, a media website launching today, is targeting a huge but elusive demographic: The millions of young, connected Obama voters who have never subscribed to a newspaper -- and never will. Younger media consumers prioritize aggregation and social recommendations over institutional authority. So while baby boomers care if a story makes the front page of the New York Times, Millenials are more moved by items that top The Huffington Post and Drudge Report, or by a popular link on Facebook or Digg, regardless of its original source. The Stimulist aims squarely at that social media culture. The site looks like a cross between The Daily Beast and a social networking page. It touts recommendations for other sites and stories ("good sh*t"), profiles of rising stars ("kind of a big deal"), original articles, and personal posts from the site's founder, MSNBC host Carlos Watson. The Stimulist, a media website launching today, is targeting a huge but elusive demographic: The millions of young, connected Obama voters who have never subscribed to a newspaper — and never will. The site looks like a cross between The Daily Beast and a social networking page. It touts recommendations for other sites and stories ("good sh*t"), profiles of rising stars ("kind of a big deal"), original articles, and personal posts from the site’s founder, MSNBC host Carlos Watson. For full disclosure and context, I met Watson this year while appearing on MSNBC, and found him a smart, talented person to watch. A glance at his accomplishments on Wikipedia will tell you that he’s more than a talking head: Harvard with honors, Stanford Law, McKinsey consulting, staffing Sen. Bob Graham, co-founding an education company (later purchased by Kaplan Inc.), and then a wide-ranging media career, too, with work at CNN, BET, CNBC and now MSNBC. Watson also just launched a new weekend show at Air America, making him the fourth MSNBC host with a radio platform, after Rachel Maddow, Ed Schultz and Joe Scarborough. Watson recounted how MSNBC President Phil Griffin sees radio as a gateway to success on political television. "Part of [Griffin’s] thought on why Rachel has been so successful is that she brought additional energy and platforms to the table, primarily radio," Watson says, adding that MSNBC valued Schultz as a progressive voice who "already had a super-charged platform of radio." For The Stimulist, a regular presence on radio and television provides far more reach than most new political websites. Promotion isn’t everything, of course, the site still has to meet a need. Watson argues there is still no new media hub for what he calls the "change generation," the young people who believe that Obama is only "the beginning of change, not the culmination." At bottom, he is working on the premise that our politics have evolved faster than our media. "If you are a left-of-center Baby Boomer, you feel like someone listened to all your hopes and dreams and gave you back N.P.R.," he told me, "and for a large swath of conservatives, Fox News feels like that." Yet there is no outlet like that for this generation, Watson says, a media space that is optimistic and dynamic, "edgy" but not snarky, and timed to the current political moment. 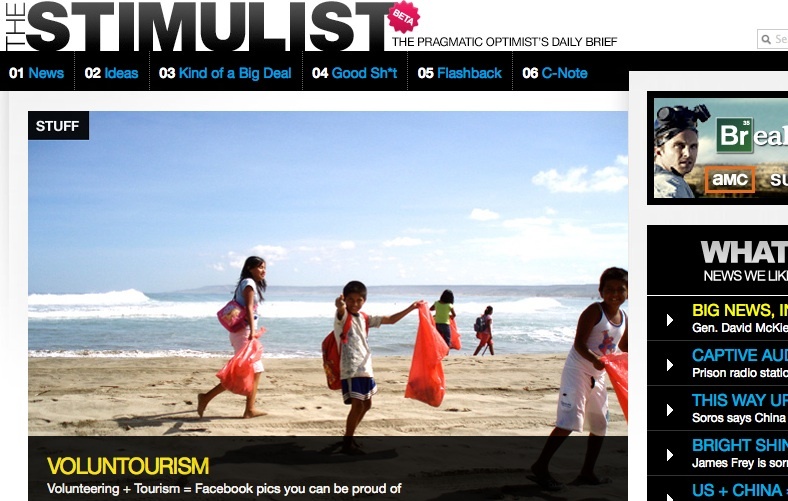 The site’s tagline even pines for that Obama flavor, promising "The Pragmatic Optimist’s Daily Brief." Several new websites are already gunning for a similar tone. Global Grind provides a "hip hop" take on news and politics, drawing over 150,000 monthly visitors with famous bloggers ranging from DJ Khaled to RNC Chair Michael Steele. (And really, what captures the hip hop Obama moment better than Michael Steele?) AOL launched Politics Daily last month, with several veteran reporters aiming for new school, non-partisan breaking news and commentary. Then The Daily Beast offers a young, buzzy tip-sheet for what’s hot online, led by its own multi-platform media maven, Tina Brown. Backed by IAC and intense media coverage, the site topped a million unique visitors for the first time in March, though by April, it was back down to 620,000 (via estimates from Compete.com). The Stimulist is projecting two million unique visitors within its first two years, according to a new article in BusinessWeek, a target that eludes most political sites. Between television and radio, though, Watson is hoping to turn a lot of casual listeners into loyal readers.